This is going to be a two-fer today, folks! This year, two picture book biographies came out about Florence Mills, an African-American performer popular in the early 1900s. I think both of them are great books and they definitely complement each other. Both picture books are great examples of narrative nonfiction and would be great to use with social studies units (including, but NOT LIMITED TO Black History Month). 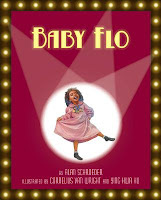 Baby Flo: Florence Mills Lights Up the Stage by Alan Schroeder, illustrated by Cornelius Van Wright and Ying-Hwa Hu. Grades 2-5. Lee & Low Books, 2012. Unpaged. Review copy provided by my local library. Florence Mills was an African-American performer in the early 1900s. Born poor in a poor neighborhood called Goat Alley in Washington D.C., Florence took any chance she got to perform. From singing songs in her neighborhood butcher shop to entering dance contest after dance contest, performing brought joy to Florence's young heart. She first appeared on stage at the age of three and got her first marquee billing at the age of seven. This picture book biography tells the story of her earliest years. The illustrations pair perfectly with the text. This is a joyful book and the sheer joy of performing is evident on Florence's face in nearly every spread. The illustrations reinforce the back matter that elaborates on Florence Mills's life and says, "... she remained cheerful and optimistic, rarely uttering a bad word about anyone." It's evident here that Florence Mills was a lovely person to know and it's no surprise that her untimely death caused a general outcry of mourning. An extensive author's note is included in the back of the book, filling in the rest of Florence's story. Several photographs are included along with information about the rest of Florence's career and personal life. She was well-loved among the performing community and it's been speculated that if not for racial issues Florence would be hailed as one of the great performers of the 20th century. Florence died at age 31 of tuberculosis (a fact I found very interesting, having recently read the excellent biography of tuberculosis, Invincible Microbe). Harlem's Little Blackbird: The Story of Florence Mills by Renee Watson, illustrated by Christian Robinson. Grades 2-5. Random House Books for Young Readers, 2012. Unpaged. Review copy provided by my local library. 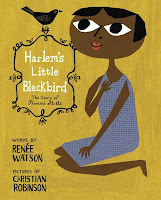 In Harlem's Little Blackbird, Renee Watson explores the entirety of Florence Mills's life, instead of concentrating on her childhood. We don't get the level of detail provided in Baby Flo, but we do get a better overall picture of her life. Florence Mills grew up in a teeny-tiny house in Washington DC, always loving to sing and dance. Eventually her singing and dancing landed her on stage in Washington (where she refused to perform if her black friends were not allowed in the theater to watch) and overseas in London, performing for the Prince of Wales. Throughout her career, Florence spoke up for equality and she remained generous of spirit. Renee Watson chooses to include song lyrics that supplement her text, giving readers a taste of the songs Florence was singing. She pairs these lyrics nicely to emphasize Florence's background singing spirituals and her continual fight for equality. Again, the illustrations pair perfectly with the text. These cut-paper collages are full of color and action, just like Florence's life was. The characters are all very expressive, and Florence is often smiling or singing (unless she's not being treated fairly). The ending spreads, discussing Florence's untimely death are sober scenes without any people pictured. An author's note gives a little information about how Renee Watson found out about Florence and names a couple of sources. These are essential biographies for your collection. As I was reading them, I thought about those biography assignments that kids have to do sometimes where they have to dress up like their subject. Florence Mills would be an excellent, little-known choice for such a project and a vaudeville costume would be such fun! Baby Flo and Harlem's Little Blackbird are both on shelves now! Happy Nonfiction Monday! This week's roundup is over at Booktalking, so make sure you stop by.